Looking after your home is not easy and it can cost money that sometimes seems easier not to have to spend on maintenance. However, regular maintenance will save you money, time, and frustration when something breaks that you haven’t taken care of, often at an inconvenient time too. 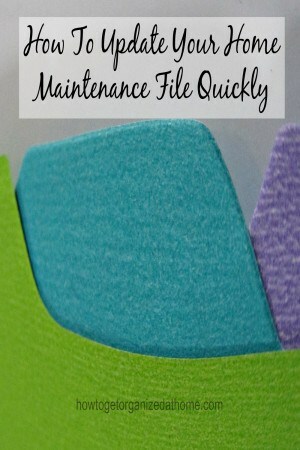 Having a home maintenance file will help to remind you of the maintenance that you need to attend to and when. What is important is understanding these costs and budgeting them into your annual budget breakdown, this way when costs get incurred you have the money available and you don’t need to borrow money for the repairs. Home ownership is not cheap and being prepared for that is key to not breaking your budget or letting your home fall into disrepair. It is important to have a home maintenance file that holds all the information which you need to ensure that you run your home effectively. However, if you haven’t looked at this file or haven’t got one then it is possible to pull together a basic home maintenance file quickly, but it will need you to work on it to bring it back up to date, ensuring you don’t forget any maintenance that your home requires. Know the dates when insurances are due and plan these into your budget. Know when items need servicing like your boiler and your heating system. Knowing when smoke alarms and carbon monoxide detectors need replacing. If you don’t have a checklist for your home which you check off each season for jobs that need doing, then you need to make a tour of your home making a note of the jobs that need doing. This will form the basis of your home maintenance file; it will allow you to start planning and preparing for any maintenance issues. Always be on the lookout for any maintenance that needs doing and work this into your plan. For instance, I have noticed a weed in my guttering this morning, so I need to take action and to put this into my family schedule for the weekend; we have many birds in the vicinity and I am sure they are responsible for this issue. Dealing with it before it blocks the guttering will ensure that it doesn’t cause any damp issues or leaks that can occur because of blockages. Taking this forward and keeping your home maintenance file up to date and accurate will ensure that you keep on top of your home maintenance. Creating an action file will help you to identify the areas of your home that need attention. Include dates of when items need checking and cross-reference this with your calendar or planner. Don’t forget to include the names and telephone numbers of professionals who you are confident of their services. If you look at the different areas of your home during the different seasons then it will ensure that you are ready for any eventuality. For example, check the roof during the summer and before the onset of bad weather. While it might be cheaper to have your roof repaired in the winter it could cost you more, because of any damage that has happened through leaking water getting into your home. Therefore, if you have neglected your home maintenance file for too long it is easy to rectify the situation and get back in control of correctly maintaining your home. If you are looking for more articles on this topic head over to the landing page where you will find links to other posts on organizing your home. Good tips. Currently we just do maintenance as we think about it. Not really a good system. Thank you for sharing at Merry Monday!